I'm not living on the edge, unless you mean "the edge of how much food I can squeeze out of my house without going to the store." Y'all, I have not been "for real" grocery shopping in over two weeks! Talk about living off my stockpile - my cupboards are looking a bit bare! Truthfully, I was not real impressed with Kroger's sales these past two weeks. I didn't need a turkey (since we didn't host Thanksgiving, and Jason will only buy the breast anyway) and I'm not a big from-scratch baker, so there wasn't a whole lot for me. It helped that we had Thanksgiving dinner at church last Sunday night (so no cooking for me), and ate so much Thursday at my Aunt Esther's house that we didn't eat dinner that night (ditto for last night, when she hosted her granddaughter's third birthday party), and we ate smoked turkey provided by my parents on Friday night. And I don't have to cook Tuesday night, because I'm going to our church's Women's Ministries Christmas banquet. I did get some milk at Sam's last night on the way home from the party, and last week one of our local store had Del Monte canned vegetables for $0.39 a can, including the no-salt varieties, so I got a few of those. I picked up two boxes of Kelloggs Frosted Mini Wheats at Walgreens last week for $1.50 each, and Jason made pancakes a couple of nights on the NEW electric griddle he bought last week! I ran by Walmart this morning, and picked up a Jennie-O Turkey Roast (with a coupon) and some already-sliced ham that was on for a good price. Jason is supposed to order some chicken breasts for us from the food service, since they have a really good price and he likes their uniform portion sizes. Hopefully, that will get me through until this weekend so I can shop for real! We had a really, really good Thanksgiving this year. Maybe the best yet. And I realized something that never quite hit me before - no matter how bad things were financially around my house growing up (and believe me, they got pretty bad) I never had to worry about what I was going to eat for Thanksgiving dinner. Whether it was God's provision or my mom's big family dinner (or a little of both) we never went without. I may have missed a meal because I was too busy, but I've never missed a meal because I couldn't afford food to eat. And that, my friends, is something to be truly thankful for. Those of you FB peeps already know this, but I had ANOTHER tire go flat on the interstate this week. Back passenger's side. Wednesday night, to be exact. Just like last time. Except this time, it was dark, and getting cold, and Jason wasn't with me. And instead of choir practice, I was on my way to Courtney's visitation. Thankfully, I was able to pull off at an exit and into a well-lit gas station parking lot, and not have to sit on the side of the dark highway. Let's be clear - I am not completely incapacitated when it comes to doing things on my car. I have had knowledge of how to change a tire, but since I've never had to actually do it, that lesson that was given nearly 18 years ago has tarnished a bit with age. So, I call Jason, hoping to have him walk me through the process. No answer. His phone goes straight to voice mail. I called my dad, and he said it would just be easier if he came up and helped me. We were about 15 minutes from where he was. Since his stroke, his physical capabilities are not what they used to be. So, I tried to get the car jacked up and the lug nuts loosened before he got there. Thanks to the inferior, factory-supplied tire iron, however, that was just not meant to be. Thanks to a nice young man named Scott, though, it did get done - he and his wife and three kids were getting gas, and saw me, and he came over and changed my tire - before my dad even got there! Anna Marie was crying about being late to her Missionettes class for the first time, but given the circumstances, they didn't even have a lesson - the teacher had the girls each make a card for Courtney's five-year-old daughter Madison, who isn't even in that class. Courtney's visitation was incredible. Pink flowers were everywhere. I stood in line for nearly half an hour to get to where she was, and instead of sorrow, I felt an incredible sense of peace once I got up there. This sounds so odd, but seeing how good she looked - and she really did look good - made me realize she was at peace, so I was too. Jason and I went to the funeral yesterday, and I left both inspired and ashamed of how petty I can sometimes be. Courtney was so sick over the past five years, yet she never wasted one minute asking "why me?" or getting bitter. She had a newborn when she was diagnosed, and she spent the next five years savoring every minute she had left and making sure Madison had good memories. I am so thankful she lasted this long, so that her daughter would be old enough to have some recollection of her. One of the most touching things I saw yesterday was at the end, when Courtney's husband Robert walked out of the sanctuary with a sleeping Madison on his shoulder. She was wearing the most beautiful pink poofy dress. Jason figured out yesterday upon closer inspection that I do indeed need a new tire. Not only am I thankful that Scott helped me, but I'm also thankful that we had that flat over the summer so that I knew what that awful sound was, and so that the spare (which had been flat the first time) would be in better shape. I started to worry for about half a second yesterday. Do I have the funds for a new tire right now? In the words of that sage teacher Whitney Houston, "HECK to the NAW." But after witnessing Courtney's courage and faith over the past two years, how can I get upset about driving on a donut tire for another few days? If she can leave such a legacy that the pastor pulled out a pair of boxing gloves at her service, saying that they reminded him of her spirit, surely I can let God help me figure something out about a stupid tire. 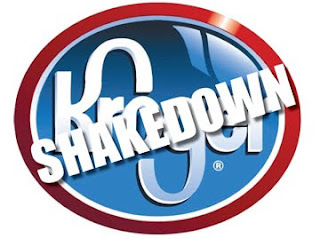 Tomorrow I'll post my Kroger Shakedown. But today, I'm feeling reflective. We received word last night that a precious young woman at our church, Courtney, had (as my mother would say) "moved away to be with God." Courtney was 30 years old, and had a five-year-old daughter. She died in her sweet husband's arms. She was diagnosed with breast cancer in 2005, after having her concerns unheard by her doctor. I suppose the doctor just thought she was too young, and didn't follow up, but by the time Courtney was treated, the disease was rather advanced. She always sat on the front row, and no matter how sick she was, she always managed a smile. I have heard (but I wasn't there at the time) that when she was first diagnosed four years ago, the whole church showed up one Sunday - hundreds of people - wearing pink hats in support. On Halloween, nearly a HUGE group donned custom-made "Team Courtney" shirts and raised over $20,000 for her at the Race for the Cure. She had no idea the effort that was directed in her honor, until she was wheeled to the race site. She was so ill that she slept in her wheelchair during the awards ceremony. Courtney had been doing much better, but began to decline in the last few months. In addition to being treated for tumors in different parts of her body, two brain tumors were found at the end of last month. She had a gamma knife procedure at the beginning of this month, but it was unclear how effective it had been. After the procedure, she began to lose short-term memory. In the past week, she has been delirious, and then unable to speak. The doctors said her tumor markers were "through the roof," and she was sent home with hospice. The family was told there was nothing else that modern medicine could do. I knew how ill she was. I knew that an "open house" had taken place on Saturday, so that her friends could help lift her spirits. I knew that friends were organizing play dates for her daughter, so that she would have some sense of normalcy through all this. I had seen the look of concern on her mother-in-law's face, as she sat in the front row on Sunday and I sang on the stage, and knew the family was burdened beyond belief. Still, hearing that news last night was a shock. I have never been so thankful for Facebook. Most of the people at our church are on, and though we were separated by geography, we could all grieve together. It was like one big "party line" telephone conversation, except I was in my PJs sitting on my couch with a laptop. I don't know why Courtney didn't pull through this time. I know it wasn't for a lack of "trying" on our part - there were more prayers sent up for her than just about anyone I know. Jason said those prayers were probably what helped her hang on this long. One thing I do know, is that Courtney is no longer in pain. And my prayer now is that that knowledge will comfort those who love her. As the Bible says, we do not grieve like those who have no hope - we know that we will see her again someday. And we'll understand it, all by and by. Like my logo? I got mad InDesign skillz now, yo. Here's the rundown on my shakedown. This was another week of the Kroger Mega Sale (buy 10 of something, get another $5 off) and I did one of those deals. I also had a $2.50 off my purchase "catalina" (one of those coupons that prints out at the checkout.) The cashier, who was harried because they only had two lanes open on a Sunday afternoon, didn't believe it was a coupon, but I persisted - hello, it's got a barcode! Just scan the dang thing! I went to Walmart on Monday, and got a couple of bell peppers and a couple of onions to make steak tips with some steak I had in the freezer. We had that Monday night, and if I'd thought about it Sunday, I could've saved myself the trip and gotten them at Kroger. I was planning on hitting up Walgreens for a sale on baking stuff, but Jason just called to inform me that the brakes on my car (which I've been complaining about for the past week, but that's another post) are shot, the rotors are going to have to be replaced, and he and my dad are on their way to Pull-A-Part to see what they can come up with. The outcome of that expedition will dictate just how much I have to spend at Walgreens! Well, it's official, so I'll tell you what my big news is. For starters, HECK to tha NAW, I am not pregnant. Just in case you were wondering. No, but the news is kinda-sorta related. I have now left the ranks of The Uninsured. That's right - after over seven years of having no medical insurance, I finally have a little card to carry around - and some more money out of my check - to prove that I am INSURED. How did this happen, you might ask? Well, about a week and a half ago, on a Friday afternoon, we got a call that our publisher was adding our newspaper to the insurance group used by his other (slightly larger) newspaper. A representative from the benefits company came by a few days later, and explained the package to us. I had to make a decision within a day, while open enrollment was still going on - it was that quick, less than a week from finding out it was being offered to signing on the dotted line. It wasn't too terribly much for me to sign up, and my employer is paying half. Unfortunately, it was HORRIBLY expensive for Jason, so, alas, he remains without insurance. He did some research, though, and it's much less expensive for him to get individual coverage through the same insurance company I now have than to get it from them through my job. So, anyway, it sounds like a small thing, but for me, it's HUGE. It's really unimaginable for me to think that the next time I get a sinus infection, I can go get a "sinus cocktail" shot and get over it quickly, instead of suffering for weeks on end. Three blog posts in as many days! What has gotten into me? Guess I've gotten a little of my mojo back, huh? We stopped at Kroger on the way home from our small group tonight, which meets at a home about two miles from one of their stores. I would have gotten through in record time, but Anna Marie was making that a bit, shall we say, DIFFICULT. But before I tell you about my Kroger haul, let me talk about Target. Did you know, sometimes Target has a deal where you get one of their gift cards just for buying something they're running a special on? Well, this past week, it was dog food. If you bought two 20 lb. bags of Dog Chow for $11.49 each, you got a $5 card. And what do you know? WE have dogs, and WE needed dog food! Plus, I also had two coupons, one for $1 off a three-pound or larger bag, and one for $1.50 off a 15 pound or larger bag, and I saw no reason why I couldn't use both. We don't have a Target here, but there's one in the next county north of us (and we had to go up there Friday anyway for something else) so we stopped in. We picked up two bags of dog food, a two-pack of DVDs for some long-since-canceled Sonic the Hedgehog cartoon series on clearance for $1.98, and, of course, a 20-ounce Coke Zero for Jason (because he can't seem to leave a store without one). The little teenage guy at the checkout totally spazzed out when he saw those Sonic DVDs. He was so mad he hadn't seen them first, and that Anna Marie had picked up the last set. It was like that SNL "Target Lady" skit come to life! In fact, he was so geeked out, he messed up our gift card! He scanned the card, like we were paying for one. Then, he took it off like we were getting it for free, and said something about it taking off $5. Fine, I thought, he's applying the gift card to this purchase. No big deal. He put the card under his cash drawer, we walked out, and my math-addled brain went to work. For the next half hour as we drove home, I tried to figure out what was bugging me, and when I looked at the receipt, I knew. He'd forgotten to give me my $5 card! So, today after church, we went back to Target. And wouldn't you know, we were blessed with double for our trouble! When the manager investigated, she saw exactly what had happened, and gave us a TEN DOLLAR card! She said the guy was new, and I told her I figured as much. It was also pretty late, and I wasn't angry. But boy, I sure was glad to see that extra $5 on that card. I basically got one of those bags of dog food for free! This week, they're running a special on Kelloggs cereal - starting at $2.66 a box, and buy three, get one free. We're out of cereal, so I picked up four boxes. Jason also picked up a clearance bag of candy-corn pumpkins, and two drinks (I'll admit, I got one too) and we paid just over $3 out of our pocket! Moving on - here is my Kroger list for this week. There is no meat, because I don't need any, and I didn't need cereal (thanks, Target!) or milk, so that isn't on there either. I tend to buy meat at our locally-owned market here in town, because they run some really good deals about once a month. Kroger is having a Mega Sale this week, where if you buy 10 of the participating products, you get another $5 off your purchase (or 50 cents off each thing). I racked up two of those, for a total of $10 more off. I also ended up with a coupon for $2.50 off my next grocery purchase, thanks to those nice people at Betty Crocker (who make all these fruit snacks I bought). And, of course a Coke Zero for Jason. That's a savings of 54%. Once again, I feel a lot of this is just bringing it down closer to what I think it OUGHT to cost. The people in front of us had a total of over $160, didn't use a single coupon, and I wanted to say, "I am so sorry. Let me help you!" And before you start deriding me for buying so much processed stuff, let me remind you: this is stockpiling. Yes, I bought four boxes of fruit snacks tonight, but those will last me about four months! One can of the chili will probably feed all three of us, as I tend to put it over baked potatoes (which I bought on sale about two weeks ago) with a little 2% milk shredded cheese (which I got on sale last week). I've got canned salmon in the pantry (that I got on sale about three weeks ago at Walgreens) and I can use that, along with a couple of potatoes and a can of the evaporated milk, to make salmon stew. See where I'm going with this? I only buy cookies about once every three months - literally, the last time I bought them was before school started. And I got them for less than $1 a pack! The other bonus to some of these foods is that they have Box Tops for Education, which help our school raise funds for stuff they need. Anna Marie is going to love her lunch tomorrow - some saltines, some turkey pepperoni, a Danimals smoothie and a banana.